As we feast on holiday foods, give gifts, decorate and travel during the holiday season, we also consume lots of resources and generate lots of waste. The amount of household garbage in the United States can increase by 25% between Thanksgiving and New Year's Day, from 4 million tons to 5 million tons. The holidays are special, but this year's festivities don't have to negatively impact our environment. There are a number of ways to decrease the amount of trash we produce and the amount of time we spend on the road. Below are some easy tips to "green" the holiday season! Think "green" while shopping. Try to buy items with minimal packaging and/or made with recycled content. Check product labels to determine an item's recyclability and whether it is made from recycled materials. Consider the durability of a product before you buy it as a gift. Cheaper, less durable items often wear out quickly, creating waste and costing you money. Look for items that embody the concept of reuse. For example: swings made from used tires, wooden toys made from scrap wood, craft kits that take advantage of used goods and discards, and drawing boards that can be erased and reused. Wrap gifts in recycled or reused wrapping paper or newspapers. Also remember to save or recycle used wrapping paper. Donate the older toys that you no longer use to charities. Bake cookies or other goodies for your friends and love ones and package them in reusable and/or recyclable containers as gifts. Compost leftover food scraps and leaves. Buy cards made from recycled paper (look for "post-consumer" content) and printed in non-toxic inks. Buy cards and envelopes that can be recycled in your town. Choose cards printed on white stock without metallic or plastic coatings. 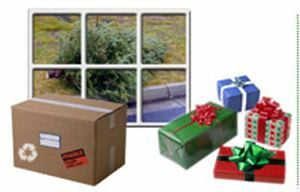 Buy cards wrapped in the least bulky or most recyclable packaging. Decorate with more energy efficient LEDs (light emitting diodes) strings rather than the larger, old fashioned lights. LEDs are small light sources that are illuminated by the movement of electrons through a semiconductor material. LEDs are exceptionally energy efficient when producing individual colors, many using up to 90% less energy than an incandescent bulb to produce the same amount of light. For example, the amount of electricity consumed by just one 7-watt incandescent bulb could power 140 LEDs — enough to light two 24-foot (7.3-meter) strings. And be sure to turn them on only when someone's around to appreciate them. Avoid foil and plastic-embossed paper because it uses more resources in its manufacturing process. When you're not enjoying a fire in your fireplace, close the flue and block the hearth to prevent heat loss. Store leftovers in reusable containers. Buy food gifts with as little packaging and processing involved as possible. Review the list of recyclables that your town or city accepts and be sure to send all the applicable paper, plastic, glass bottles and aluminum cans to the recycling center. Bring your own bags on shopping trips so shops won't have to give you new ones with your purchases. If using a plastic bag, be sure to bring it back to the store for recycling next time you go. Don't accept a new gift box with your purchase if you have a supply of old ones, or try to wrap it without a box. Use your legs or mass transit when shopping or buy your gifts by phone or internet. Make a decision to go to shops in areas you can walk or bike to, rather than the ones you have to drive to. When you need to drive, combine several errands into one trip or travel with friends. If you are traveling during the holidays consider taking public transportation or car pooling with friends or relatives. Buy a smaller tree. There's less to dispose of when you take it down, and shorter growing time translates into less land required. If your town doesn't have a tree chipping/reuse system, ask why.